Doing Repairs , or even buying land. You needs to read the two important articles in these links . There are many scams and pitfalls you need to be aware of when you decide to build in Indonesia. Some of these issues have been discussed in detail within some threads of this forum already . These stories below reinforce some of those points already covered , and add many other excellent points to also be concidered when building , or planing to build , or when buying land . This 1st link - is from the latest "Fixed Abode " column , which regularly appears in the Bali Advertiser newspaper for expats . The articles are written to de-mystify the many problematic areas of " building in Indonesia " . The authors other previous articles are also available for free download on the "Bali Advertiser website" , and make an important, and interesting read for anyone wanting, or considering to either ; Build , Repair, or Renovate . This 2nd link - is an article which tells of the horror story endured by a couple of retirees, who had planned to build their dream villa and live happily ever after . Althought the stories are Bali based , It is the same story throughout the whole Indonesian Archipelago. Tread the waters wisely !!! The biggest scam I got was the builder's breaks. They got longer and longer until I sacked the lot of them. The next was free gifts from the builder's merchant. The free gifts never get as far as the house. The builders pinched them. The quality of work was rubbish. I had them rip things down and do it again several times. There is a very small restraunt being built near me where I can view the progress from my house .I dont know if there is an underlying story here , but I cant understand why it has taken two tukang kayu ( carpenters ) 5 separate "whole day visits" , spaced over 1 month ( thats the only time they were there = 80 man hours ) to cut and nail down the timber decking for a .... 2.5 metre X 1.5 metre veranda . Honestly , this is half to 1 days days work for 1 person , and I watch these guys sit and talk for 1 hour , then hammer 2 nails , wait 2 hours do a saw cut ..., thats it .... Perhaps they have other jobs , but from they're pace I doubt it , as they could have both finished that task in half a day , and still relaxed ,talked ,and worked slowly . In 3 months ive seen a window frame go in and the veranda deck get nailed down . - and learnt about latest improvements and discoveries and new products and their recomended applications . After the completion of the 4 years full time on the job training , and completing the full technical college courses ,and passing all examinations and assignments , they get a certficate in floor and wall tiling from the college on successfull completion, it is only then that they finally get a completion of apprentiship certificate from the government , which earn the title of a " tradesman tiler" . To be licenced as a Tiler contracter , after you acheive tradesman status ( ie; completed your apprentiship) , and this is another level to progress to even further , as you need to be backed financialy to a certain degree which dictates what degree ( $ value of work ) of contracted work you can take on within a financial year. - a demerit system applies so you can also loose your right to work . The tiler in Indonesia is usually off to a bad start to begin with by poor building design , and by being untrained . Lets look at the reasons we see so many tiles lifting , and falling off walls here . 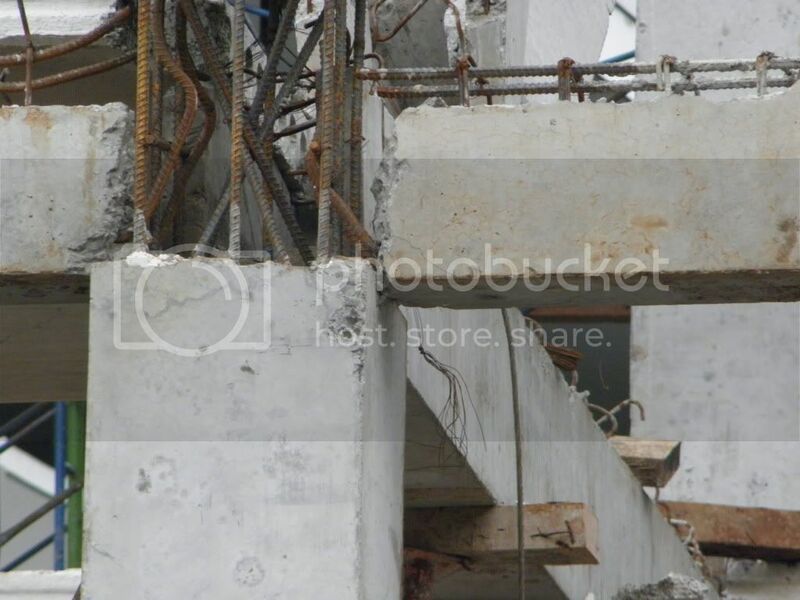 (problem#1) his substate ( floor ) will usually be unstable , ie; the packed limestone with a skim of mortar over the top which is mostly used here , and not a minimum 100 MM thick steel reinforced concrete slab , as we at least have come to expect in the west. (problem#3) the building usually wont be square ( 90 degree angles) meaning the tiles will be cut in a ugly weird angle alond 1 or 2 sides of the walls. (problem#4) often low cement content in mixes that adhere tiles to the floors and walls , and non availablity of the far superior rubberbased glues like resoflex . (problem#5) tiles applied too early after masonry has been rendered , while not allowing moisture and possible lime leeching to expell itself from walls - or left too long that walls are too dirty providing an unsuitable surface to stick tiles to . (problem#6 ) far too often it is realised after the tiling is complete that water does not flow towards and then into the floor drain ... this is just the start . followed by keeping an eye on that work periodically , to make sure there is no confusion with this as the work is happening , and also making sure no shortcuts are happening which takes away the integrity of quality. but more often than not , the tecniques , and materials used are wrong , giving the tiles reasons to fail . Give them a good substrate to begin with , and then good materials to work with , followed by supervision from an experienced "hands -on" supervisor who can keep on eye on work , and give them good advise beforehand , and during the work in progress, You will avoid many of the stuff ups before they happen. You need someone who is trained in, and understands correct building design principles , and who makes sure that those principles have been implimented in the building during the planning and construction stages ..., and you will get a good job done right. Mas Fred , when you refer to the free gifts , do you mean things like free towel rails , or other particular items etc , that the merchant might throw in because you bought lot of materials from them ..., that are getting stolen ? Great information you are providing here, davo. A list of local recommended tukang that you know or can be referred to would be a great complement. Good link, .. a fool and his money are easily parted. just taking the thread off on a slightly different angle, the second article was a real eye opener. I just wonder 100k Euro, reasonable return if invested would be say 7-8% i.e. 10 to 11kUSD. what sort of property could you rent for that in Bali? would it be similar to what they built, especially if you went for a two year contract. We have conteplated purchasing the last few years, but I think long term lease or two year rental might be a better option and far less risky. It would , but it all begins with the planning ..., in fact 90% of the whole project is in the planning , as the contruction is the easy part . Without a well thought out design incorporating all the elements of good design , with and fool proof proven construct methods , which utilise engineering design , and a good ecconomical approach ...., then the building is really doomed to begin with . If its not well thought out and planned before you begin before the construction stage , then expect problems and expence problems to " blow out " later . Only with a good well thought out set of detailed plans , can a strategy for an efficient construction begin , and a time saving critical path ( a sequence of tasks that must be completed before another can begin ) be followed. Without a crittical path a Gantt chart ( the forcasted timeframe / schedual of completed works ) cannot be completed , during this stage estimated manhours for individual tasks are calculated . With a good thought out detailed plan and all the above being well thought out , you can do a more accurate quantaty survey of materials needed . You see its a chain of stuffups one after the other if the planning is not sorted in the first place , and if all this is done correctly , ie; all the above , then you have a sequence of events to carefully follow ( as planned ) , with correct design incorporated ......., now the work just needs to be supervised correctly to ensure that the quality of workmanship is maintained and correct procedures are followed . Some contractors will tell you no-worries , she'll be right , seng ken ken , ora ora opo , tidak apa apa , etc ..., but thats "BS" , without a good thought out plan ,project management ,and supervision you will end up with ; a mightmare , a more expensive job with less quality garaunteed . A good job is all in the planning - then in the supervision - then in the tukang .
" Do it right the First Time " & " measure twice cut once "
Last edited by davobali; 10-03-11, 14:22. Watch out for build quality. Any half brained monkey seems to be qualified in everything but tend to be qualified in nothing. A very open ended question with an open ended answer , rent ranges from super cheap to the super rediculous , as does the price of land .... it makes me laugh when i hear of peoples intentions to hop on a plane with intentions of quickly finding that ideal block land at a good price , and i even laugh more ( not in their face of course) , when they say the building is all organised , without having all the details as those covered in this thread , and that "such and such" said it will be finished by such and such date - yeah right ! Renting is the cheapest and most risk free option , but in saying that, renting presents its own set of risks too ( ask T_ _ C ) and see the thread on renting . But when you build , its yours ( to within the legalities of your individual situation , and the laws of Indonesia ) and you are free to be as creative as you like to within your budget ..., and that can be satisfying . Its really up to the individual . I personly think buying here is crazy unless you have lived here for a while , at least long enough to be familiar with the pitfalls , the country and the way things are done , and you are comfortable with it all . You need to know and feel the difference between living here and holidaying here. Buying property and to also deal with building here , without going someway through the learning curve that Indo is , and without knowing the scams and pitfalls , and without proper planning ...., is asking for a nervous breakdown IMHO. Last edited by davobali; 10-03-11, 15:10. I took it myself a week or so ago. I understand a previous piece fell down, killing a bloke. They haven't improved a lot as you can see with the state of that crappy workmanship. It's a three story building. Want one? That's roughly what they did. there is some excellent info within this site. [SIZE=4][FONT=Verdana]"Last night I lay in bed looking up at the stars in the sky and I thought to myself, where the heck is the ceiling." [SIZE=2]could this have something to do with indo building standards?